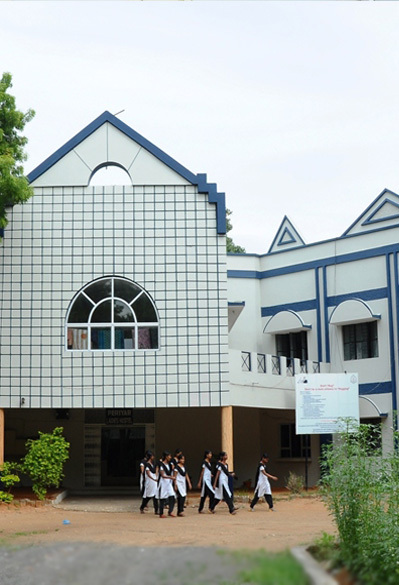 Periyar Girls Hostel is a home with academic atmosphere and located amidst natural environs in an elevated ground. Motherly Warden and the Deputy look after the inmates. Rights of admission is reserved by the Management. Break fast 07.00a.m to 07.45a.m. Tiffin and Tea 05.00p.m to 06.00p.m. During working hours, students are not allowed to stay in the room without attending class. In the event of their need, they must get prior permission from the warden. During holidays, students are not allowed to go for outing without any permission from the warden. To go out of station, Outpass can be obtained from the hostel office. Students should not hold any meeting in the hostel premises without permission from the warden. Guests are not allowed to stay in the hostel premises. Students are expected to maintain strict discipline in the hostel and the management holds the right to vacate them without assigning any reason. Medical treatment will be given to the students suffering from illness. They are advised to have a complete record of the illness if they have suffered earlier. Students should pay the mess fees before 10th of every month. Fine will be collected after due date. Visitors with ID card are allotted to meet their wards every Sunday between 8 A.M and 6 P.M. Outings permitted once a month with authorised visitors but on any account, the students must return to hostel premises before 6 P.M. If they fail to pay the fees before 25th, they will not be allowed to stay in hostel. Reduction can not be claimed in case of leave availed on their own reasons.